The Cup Cozy Pillow keeps your drinks close to you and safe from spills. LAS VEGAS - June 27, 2016 - PRLog -- Everyone knows the aggravation of having to deal with the aftermath of spilling their drink. It's such a problem that entire industries have been created to treat the stains caused from those spills. Yet there has been little effort made to finding a solution which would prevent those spills from happening in the first place. That is, until now. After being fired from her job during maternity leave with her twins, Monica Almaguer started her own online business. As a mother of four children she found she was having trouble keeping her favorite drink close to her and safe from spills. She spent hours on the couch working with her laptop. "I found myself creating an island of pillows around my drink on the couch cushion next to me, trying to keep it safe from spilling." Frustrated, she went to the store, bought a pillow and cut a hole in the middle of it. The first Cup Cozy Pillow was born. "When my family started arguing over who would get to use it, I knew I had something." Despite having no experience in bringing a product to market, she felt she had to help other families. So she spent the last six months refining the design and looking for a manufacturer. Monica excitedly proclaims the Cup Cozy Pillow as "the world's best cup holding pillow." Both the three hole Cup Cozy Pillow and the five hole Cup Cozy Deluxe Pillow have at least one hole with patent pending cut outs that allows coffee mugs and beer steins to be snug, safe and free from spills. "There is literally no other cup holding pillow in the world that has that feature" Monica notes. Made out of the same foam found in many coolers, it naturally insulates your hot or cold drinks so you can enjoy them longer. The foam stretches slightly to hug each cup and hold it in place. Even when the pillow is turned vertically, most cups will stay in place. The removable, washable covers are offered in seven fabric choices. "As a mom I know how important it is to make a product not only functional, but beautiful as well." she says. Monica is optimistic that the Cup Cozy Pillow will become a household name. "It's one of those products that once you use it, you can never go without." With the product development complete, she plans to presale the Cup Cozy Pillow on the crowdfunding website Kickstarter.com beginning July 16, 2016. 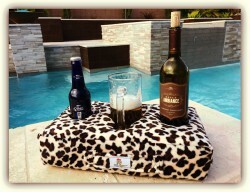 For more information about the Cup Cozy Pillow visit http://cupcozypillow.com or email Monica at info@cupcozypillow.com.